ISR is coming to Spring Branch, TX! Senior Master Instructors, Tanya Carew and Katie Mercadante will be traveling to Spring Branch, TX to provide ISR Self-Rescue™ lessons to families in the area, as well as train Infant Swimming Resource Instructors in the Spring Branch Community. 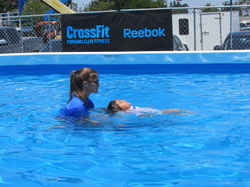 CrossFit Kids is sponsoring student lessons and full lessons scholarships are available. These extremely generous sponsorships are valued at over $500 each, and we are very grateful to CrossFit Kids for their support of the Spring Branch community! To begin the registration process, please click here. "For the past 25 years, teaching ISR Self-Rescue skills to infants and young children has been my passion and my life's mission. In addition, I have been both privileged and inspired by the Instructors with whom I have worked in a collective effort to prevent childhood drowning. With the partnership of the ISR and CrossFit organizations, I am honored to be a representative to further educate communities and provide a gift that is priceless."